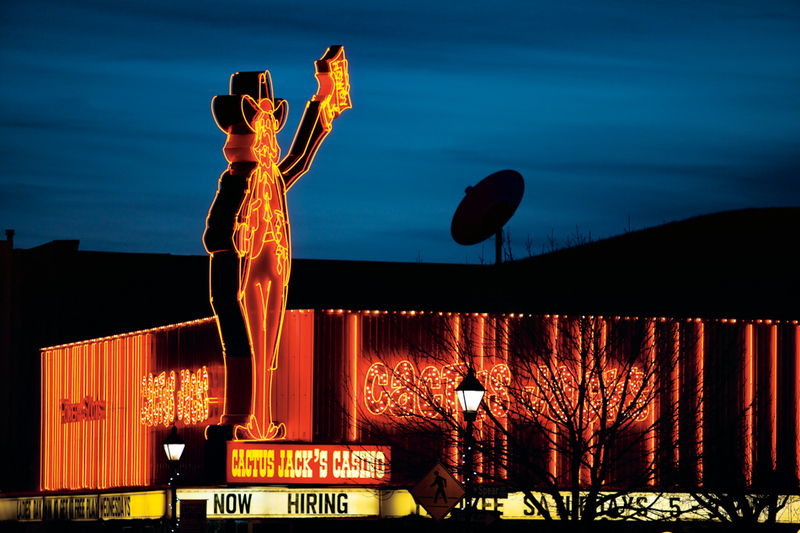 Whenever Carson City, Nevada, comes up in conversation, the initial question is usually, "How far is that from Vegas?" My response is always the same: "About 20 minutes closer than Lake Tahoe." Brows furrow, then skepticism settles in until a map is pulled out; Nevada's state capital is a mere 15 miles from the east shore of Lake Tahoe. The other main misconception is that Carson City is nothing but dry, barren desert. But pedal a couple miles from the historic State Capitol building up King's or Ash Canyon and you'll be deep in a Jeffrey pine forest. Two hours of climbing and 4,000 vertical feet later, you'll be on top of 8,780-foot-high Marlette Peak, riding the iconic Tahoe Rim Trail overlooking the magnificence of both Lake Tahoe and Marlette Lake. Understanding Carson City's roots is critical to understanding the area's appeal for mountain biking. Carson City is one of America's most storied frontier cities, originally settled during the 1849 Gold Rush after its namesake, Kit Carson, scouted the Eagle Valley. Ten years later, the Comstock Lode was discovered in the mountains east of Carson, establishing Virginia City as one of the richest silver strike towns in history. In the early 1860s, a young Samuel Clemens traveled from Missouri to Carson, eventually working for the Territorial Enterprise in Virginia City as a reporter, giving birth to his pseudonym: Mark Twain. In "Roughing It," Twain documented his unfulfilled dream of prospecting wealth in Virginia City, but his words are far richer today than any amount of Comstock silver. One hundred and fifty years later, Carson City hasn't changed much. Gambling and brothels are still legal, people still ride horses and prospect, people still love guns and people still get things done with spit and a handshake. Although Carson City is a 20-minute drive from the glitz of Lake Tahoe, the rough-and-ready vibe of Carson feels like stepping through a time portal. This frontier attitude is a matter of local pride that will never be relinquished. There's no shortage of colorful characters in Carson, known by some as 'Cartoon City.' I got a glimpse of this in 2014 at the Sesquicentennial celebration of Nevada Day, a state holiday residents take very seriously. The parade celebrating the state's battle-born roots during the Civil War was unforgettable, surpassing any Fourth of July celebration; a hint at Nevada's staunchly libertarian ideals. The five-hour parade was dominated by hundreds of bearded locals firing guns while marching down Carson Street, and that doesn't even count the men. On the topic of mountain bikes, the story of Carson isn't so much what the area already offers, but what it is destined to become. Carson City is a prime example of what can happen when local government, a federal land-management agency and residents unite under a common cause. The only thing more impressive than the number of trails built here over the last 10 years is the number of new legal trails that will exist in the next 10 years. Thanks to local trail-building efforts from nonprofits Muscle Powered and the Carson Valley Trails Association (CVTA), both the Carson and Eagle valleys have recently exploded with new trails. Ten years ago, mountain bikers who lived within the city limits had to drive 40 minutes south to the Pine Nuts Mountains to get their fix on a network of moto trails. Tiring of the drive and growing conflict with moto riders, a group of mountain bikers turned trail builders constructed an extensive network of singletrack around King's and Ash Canyon, a 10-minute ride from the heart of town and the crown jewel of Carson's trail network. Closer to downtown are Longview and C Hill trails, which start out smooth and meandering then pitch upward aggressively with tight, technical, rocky features. For an even greater technical challenge, on the east side of town is Prison Hill. A couple of options to the ridge-top loop exist, including an extremely rocky, narrow and technical singletrack from the north that can only be cleaned with an A+ game. The resulting views of Carson City, the Sierra Nevada mountain range and trailside rock formations on the ridge make the demanding ascent worthwhile, as does the romp back down–especially on a capable trail bike. In true frontier fashion, nobody asked permission to build most of these trails; they just appeared on both public and private land. But unlike some cities in which illegal trails are quickly shut down and tickets issued, Carson City saw the potential the trails had for recreation and tourism, and worked with the builders to legalize them. Through the cooperation of the city, the Humboldt-Toiyabe National Forest, Carson Ranger District and private-property owners, a large portion of the trails in King's and Ash Canyon are now either legal or in the process of becoming legal. To the south, the CVTA recently completed Clear Creek, an 11- mile trail that flows with remarkable ease, fun for both beginner and expert riders. Starting in high-desert terrain off Jack's Valley Road and gently climbing 1,250 vertical feet past massive rock formations into a lush pine forest, Clear Creek offers commanding views of the Carson Valley and the towering 10,000-foot peaks separating it from the Tahoe Basin. As of now, the trail is an out-and-back, but the CVTA and Muscle Powered are working to make the trail cross underneath Highway 50 and eventually join Ash to the King's trail network, a critical connection that will make Carson City even more appealing for recreation. Proving its worth as a mountain-bike destination, Carson City will this year join Prescott, Arizona, and Grand Junction, Colorado, as the third stop in the growing Epic Rides Off-Road Series. The Carson City Off-Road will in mid-June feature three lengths of backcountry mountain biking courses, all starting and finishing in the heart of downtown Carson City. The 50-mile event will test mettle, with a proposed 7,500 feet of climbing on trails like the Tahoe Rim Trail, the new Snapdragon and the Ash to King's. Ask Epic Rides President Todd Sadow his experience working with city, state, federal and private entities in Carson, and a smile immediately flashes across his face. "Of all the events I've ever put on, we've never had permits delivered quicker than with the Carson City Off-Road. The Carson City Visitors Bureau and its residents really want this event, and so does Governor Sandoval, who of course lives in Carson City," he says. When Sadow was scouting potential courses, the only safe route down from the high country to Carson City was on an illegal trail crossing private property. Sadow went to the Visitors Bureau and mentioned his dilemma. Within a couple of days, permission from private landowners was being secured to use the trail during the event. What's more, the city and area land agencies have been instrumental in fast-tracking new trails to be built on federal and state lands for future Carson City Off-Road events. This make-it-happen attitude is quintessential Carson City, bucking the trend of municipalities riddled with bureaucracy and red tape. It helps that Carson is one of America's smallest state capitals, with a population barely north of 55,000 residents. Simply walk down the street on a weekday during lunch break and one can shake hands with the very people who make the decisions for both the city and the state of Nevada. By the way, the city also approved an open-container permit for all of downtown during the Carson City Off-Road weekend. Besides the new trails, not much has changed in this historic frontier city. 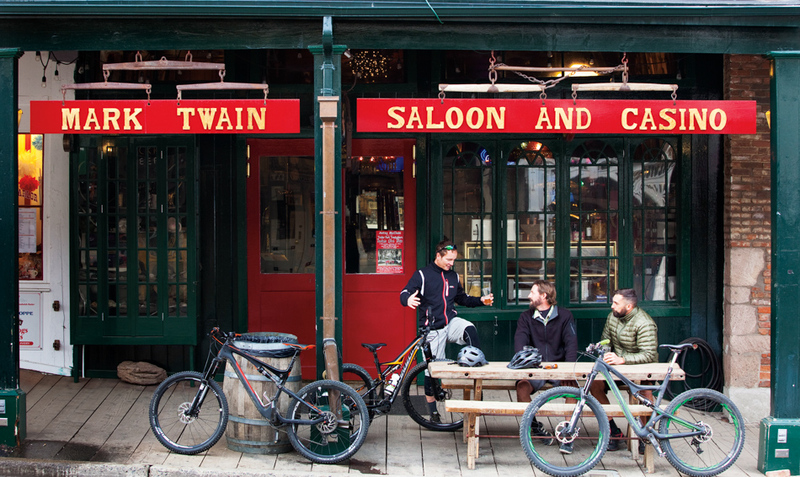 EAT | Firkin and Fox is a classic après-ride grub and grog stop in the heart of downtown, inside the historic St. Charles Hotel, one of Carson's oldest buildings. Comma Coffee is the mandatory pre-ride fuel-up for coffee and breakfast. If you're going deep, one cinnamon roll will fuel you the entire 20-mile climb to Marlette Peak. 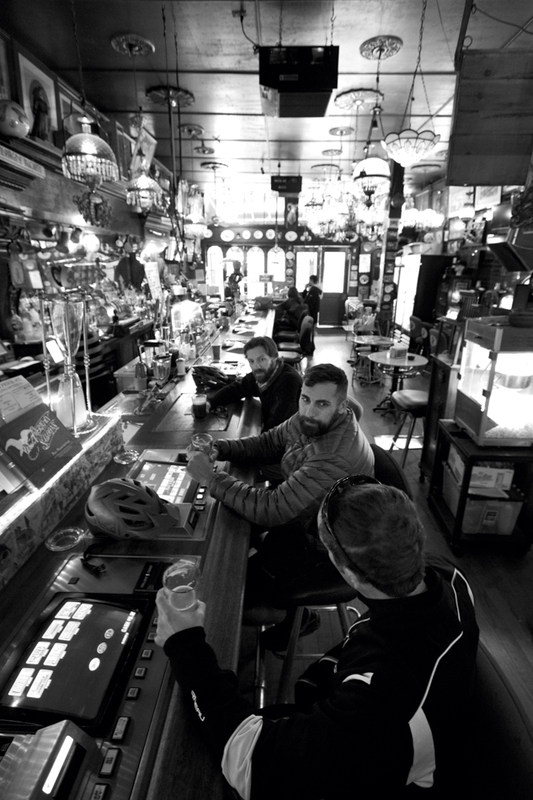 If the post-ride appetite and thirst is voracious, Red's Old 395 Grill is the spot. Red's has more than 100 draft beers, massive barbecued rib racks and museum-quality Nevada history everywhere. STAY | Carson City has numerous hotels and hotel/casino options with bargain prices. For the closest trail access, check out City Center Hotel. Gold Dust West Casino is ideal for RVers, and Casino Fandango has a hotel, casino, restaurant and movie theatre all in one. Additionally, Washoe Lake State Park offers campsites with sweeping views of the Sierra Nevada within a 10-minute drive from the city. Another camping option is Davis Creek State Park in Washoe Valley, hidden in a beautiful Jeffrey pine forest at the base of the Sierras. TRAILS | Check out carsonvalleytrails.org for trail beta and information on upcoming projects and events.